During a quick trip to Washington, D.C. to speak at a program sponsored by the American Psychological Association’s Center for Organizational Excellence, I proved once again why my nickname should be Mr. 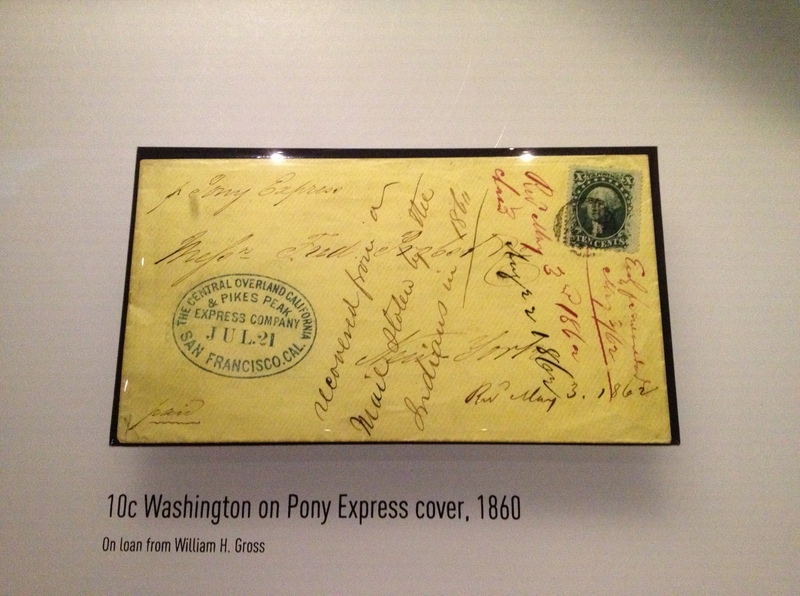 Excitement: Given a free afternoon, among all of D.C.’s many cultural and historic attractions, I chose to visit the National Postal Museum, adjacent to Union Station. In other words, I spent my time looking mainly at old postage stamps. Now, in my defense, I should explain that the weather was lousy, I didn’t have unlimited time, and both my hotel and the APA program were near Union Station. More importantly, on the merits, this museum is a hidden treasure for history buffs and stamp collectors alike. It’s also free, uncrowded, and can be enjoyed in an hour or two. During grade school, I was an avid stamp collector. 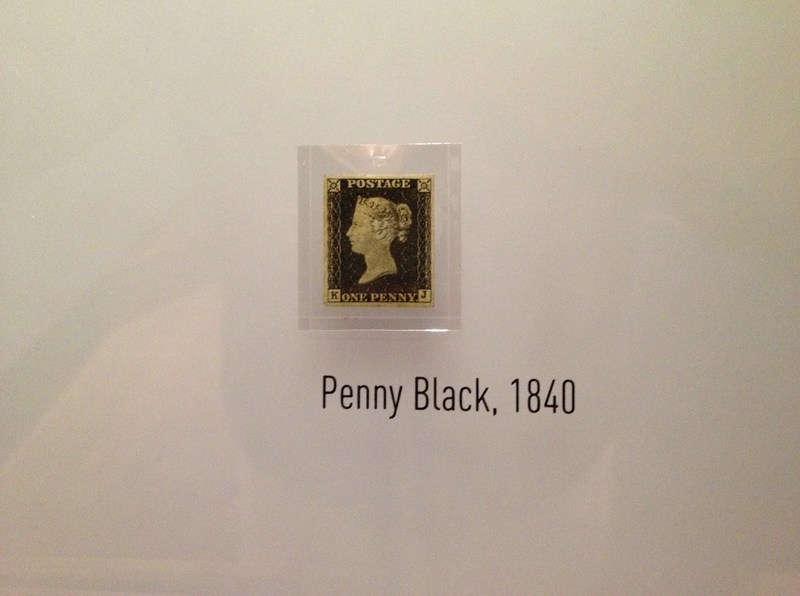 So even today I understood how neat it is to see a specimen of the Penny Black (above), the first modern postage stamp. And as a lifelong student of American history, viewing the Pony Express cover below stoked my imagination about the Old West. You see, stamp collecting’s biggest fascinations for me were the stories told by the stamps themselves and the imagined journeys of the letters and parcels to which they were affixed. I learned a lot about history, geography, culture, and famous people of all stripes and colors through stamps. As a young boy who loved trains and airplanes, stamp collecting played right into those affinities. 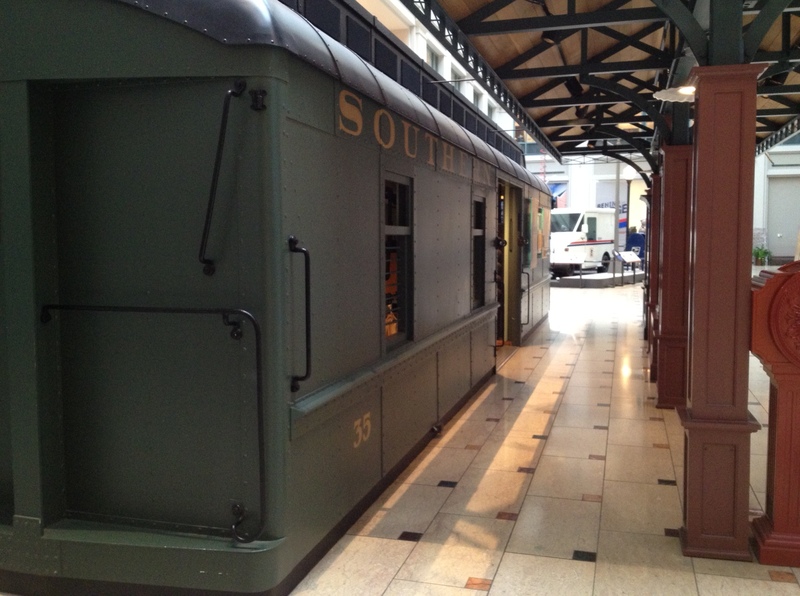 At the museum, you can step right into the old mail car pictured above and imagine postal clerks sorting letters and packages as the train zips along the tracks. 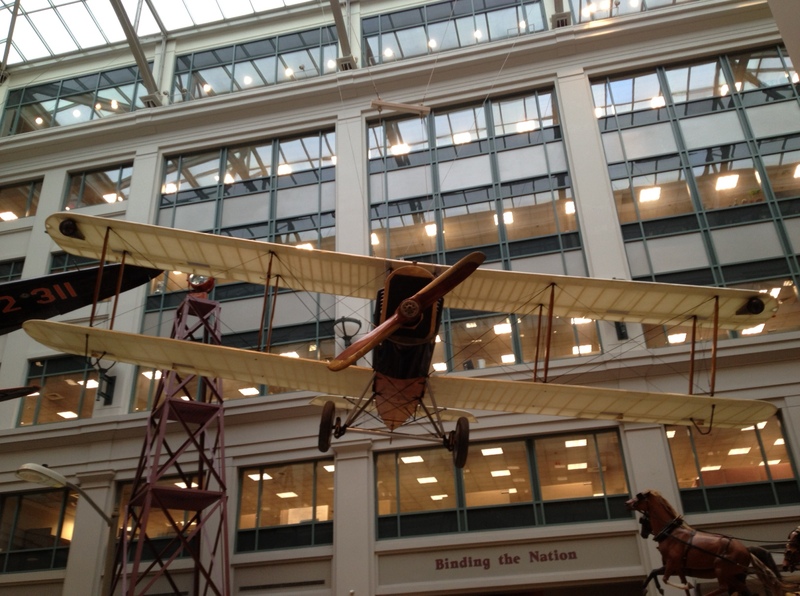 You can also gaze at this vintage, post-World War I de Havilland biplane and picture the daring young flyers who pioneered early air mail delivery. 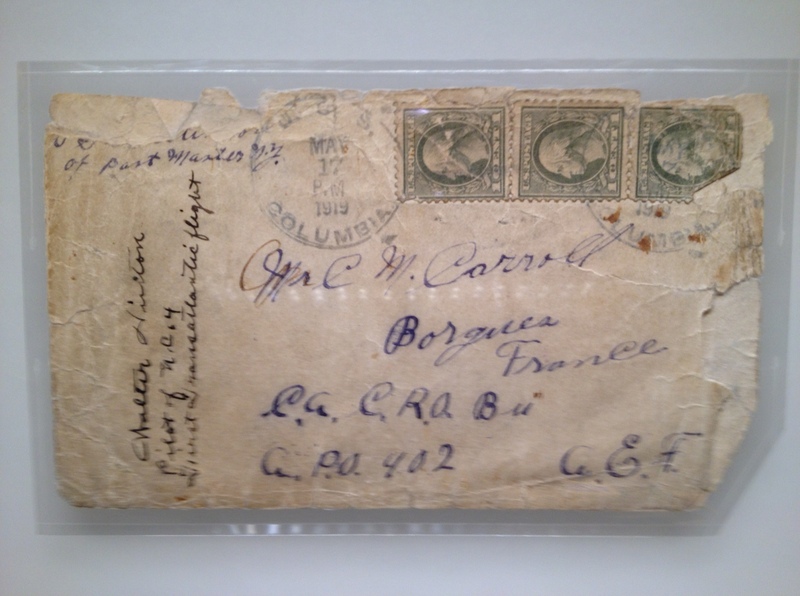 The cover below was the only piece of mail carried by the first airplane to cross the Atlantic Ocean from the U.S. to Europe in 1919. I read about this historic flight when I was a kid! 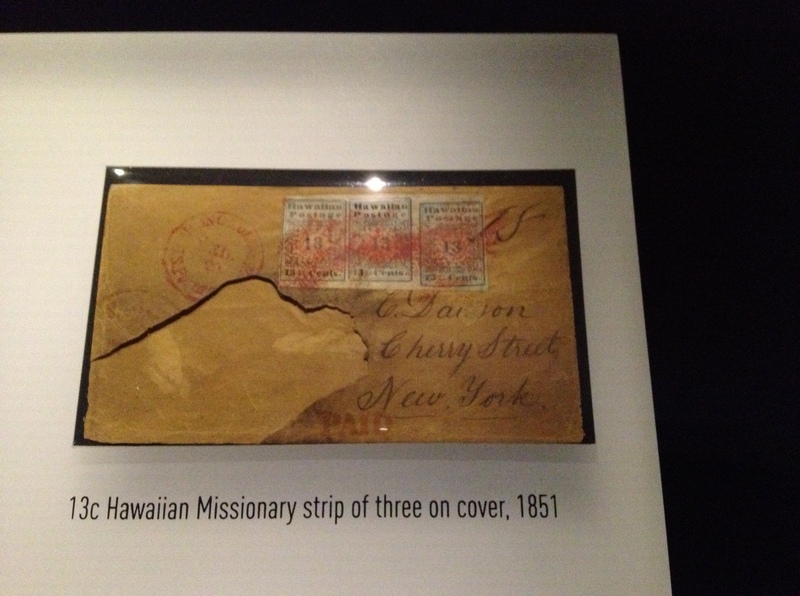 Given that both sides of my family are from Hawaii, I’ve long been fascinated by Hawaiian history. 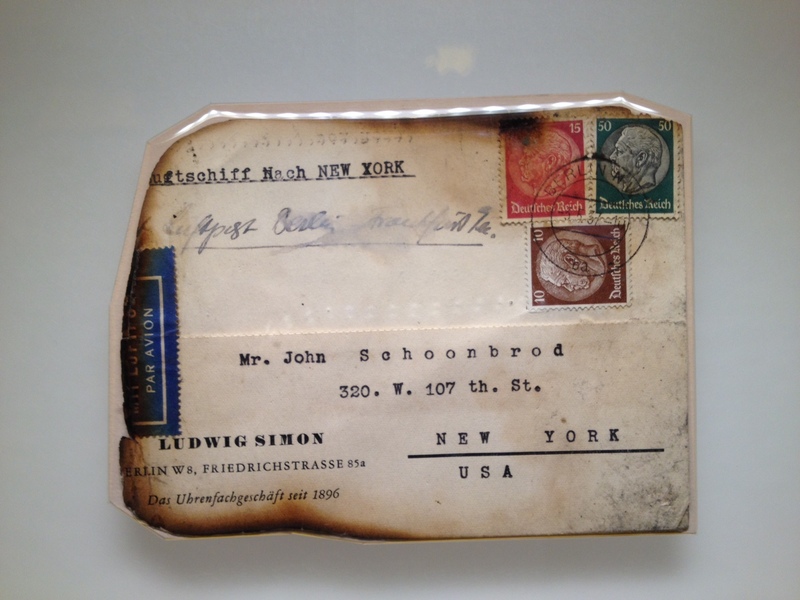 Postage stamps are a part of that story, and some collectors specialize in them. In fact, one of my stamp collecting keepsakes is an unused private parcel stamp from the late 1890s, for use on the Kahului (Maui) railroad line. My late Aunty Elaine gave it to me years ago when I was stamp collecting. When our family visited Maui in 1966, we went on the very last train ride of the old Kahului railroad, a treasured memory to this day. Aww….I wonder how many cats auditioned for this gig? I shouldn’t dwell solely on the older stamps, so here’s a more recent one that caught my eye. 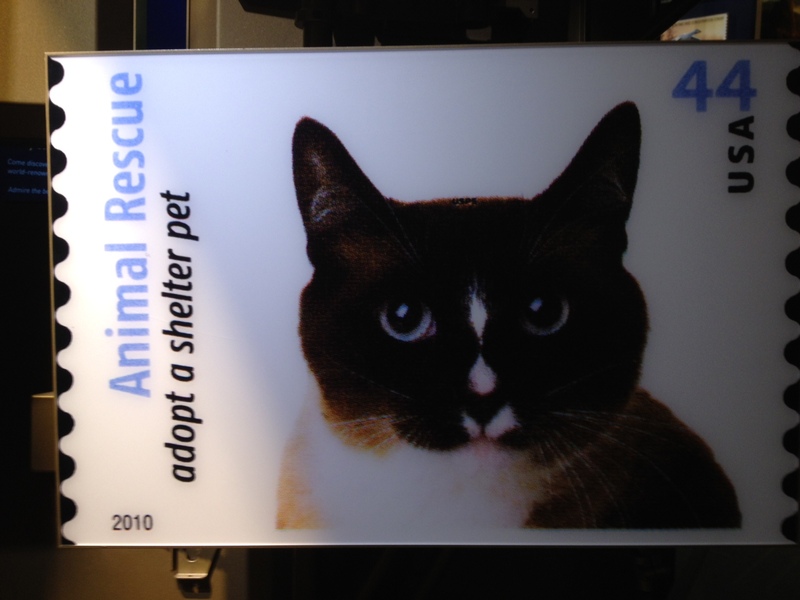 This adorable little critter was one of ten cats and dogs selected for a postal commemorative series celebrating the adoption of rescue animals. About a decade ago, I attempted to get back into stamp collecting, but I found that work and other activities got in the way of this studious and more reflective hobby. Over the years, however, I’ve continued to pick up stamp issues and covers here and there. Somewhere within me the stamp collector still lurks, and this was proven to me again by my enjoyable visit to the museum. Every so often, I feel moved to blog about coffee. The hearty brew is a daily part of my life. Today I consume coffee for a variety of reasons. Its caffeinated punch (no decaf for me, thank you), aroma, and taste all count for me. Plus, there’s something about the aesthetics of being a coffee drinker that appeals to me. I was a latecomer to the coffee thang. I didn’t drink it regularly until my mid-thirties, and it’s no mere coincidence that I became a tenure-track faculty member around then! That late night cup (or two) helped me get through a lot of heavy-duty initial class preps and exam grading. But I’m not exactly a coffee connoisseur — while a fresh, organic blend is always nice, in a pinch I’m happy to swill whatever is served at local convenience stores. 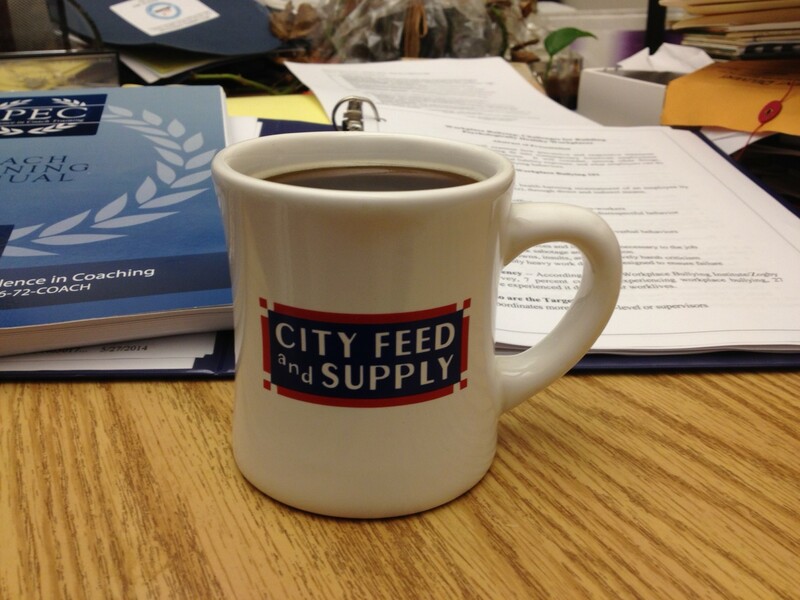 At home, most of my coffee comes from the City Feed and Supply store in my Boston neighborhood of Jamaica Plain. They sell assorted blends of Equal Exchange fair trade, organic coffee, all of which brew up nicely in my ordinary drip coffee maker. I don’t know whether this is a good thing or not, but I’ve reached a point where I can enjoy coffee well into the evening hours and experience the caffeine kick, without being rendered an insomniac for the night. At work, a couple of years ago I bought a Keurig coffee maker for our office suite, and I usually pop in a K-cup every day. It’s not as good as the homebrewed stuff, but it’s fast, convenient, and relatively inexpensive. One might think that my job as an academic affords plenty of opportunities to work or relax in cafés and coffeehouses, but I’ve found that to be illusory when meetings and other obligations pile up. Still, I want to make more time for this. I can be quite productive in such settings, with my laptop or iPad in front of me and some coffee and a morsel on the side. I’ve got no grand insights here. I’ve noticed a lot of Facebook postings about coffee lately, and apparently they rubbed off on me. Time for a refill. Many students of history will recognize this iconic opening theme of Victory at Sea, the celebrated 1952 television documentary series about naval warfare during the Second World War. The 26-part series first aired on NBC, and it garnered Emmy and Peabody Awards. With extensive archival film footage of WWII naval operations, the steady, serious narration by Leonard Graves, and the beautiful score by Richard Rodgers, Victory at Sea was a television milestone that has held up to this day. VAS has been part of three distinct chapters of my life. The first was as a grade schooler in the late 60s, when a local television station would rerun episodes every week. These years marked the beginning of my lifelong enjoyment of history, and I couldn’t get enough of the series. The second was when I bought a cassette tape of the VAS soundtrack at the Barnes & Noble on 5th Avenue and 18th Street in Manhattan during law school. While others may have walked the city streets grooving to the latest creations from East Village bands on their Walkman portable cassette players, I bopped around town listening to the soundtrack from a 1952 documentary. Geekdom, indeed. More recently, I’ve enjoyed watching VAS episodes when visiting one of my dear friends, retired naval officer and fellow history buff Brian McCrane. Brian grew up during the WWII era and later entered the U.S. Naval Academy at Annapolis, followed by a distinguished career as an officer and captain on destroyers during the Cold War. It’s fun to watch these episodes with someone whose own career contributed to the making of history. When first available on VHS and then DVD formats, the complete set of Victory at Sea was somewhat pricey. But now, a full DVD edition, re-released in 2012, lists at $9.98, well within the budgets of most viewers. It remains a stirring, impressive work of documentary filmmaking on a vitally important chapter of history. Over the weekend, one of my college classmates (that’s you, Jon!) posted on Facebook a quick little remembrance of our graduation day from Valparaiso University on May 17, 1981. Of course, the mere mention of that time triggered a bout of nostalgia, a chronic condition that is both my blessing and curse. Now, I wasn’t actually at our Commencement, which is how the seemingly random inclusion of this grainy snapshot of Lucerne, Switzerland figures into the story. I had finished up my undergraduate career with a spring semester abroad in Cambridge, England, and I was spending three weeks traveling on the European continent with my friends. My graduation day was spent with fellow VU sojourners David, Joanne, and Liana in Lucerne, where we took a boat ride and finished up the day with dinner at a waterside café, from where I snapped this photo. Study abroad was a very different experience back in the day. No Internet, e-mail, or smartphones. Our primary connection to friends & family back home was the postal service, which made the daily mail delivery an important event. As study abroad sites go, England is about as safe & secure as they come, but we truly felt like we were on a foreign adventure. My biggest technological novelty was an ATM card from a local British bank. I didn’t own a credit card. In the house designated as the residence for men, our music system was a small portable cassette player that my friend Don had “borrowed” from the office of the school newspaper back at VU, where we both had spent many hours as collegiate news scribes. Looking at that photo and applying rose-colored glasses, it’s easy to lapse into thinking of those days as being carefree and without anxiety, softened by images of vagabonding around Europe. Truth is, I was full of uncertainties and very much a work in progress. I had sufficient wisdom back then to know that I was very, very fortunate to have that study abroad experience, but my inner focus was impatiently and continually on the future and what it might bring. I’ve reached the age where the fading old Kodak snapshots from my semester abroad look like something from another era, and for good reason. 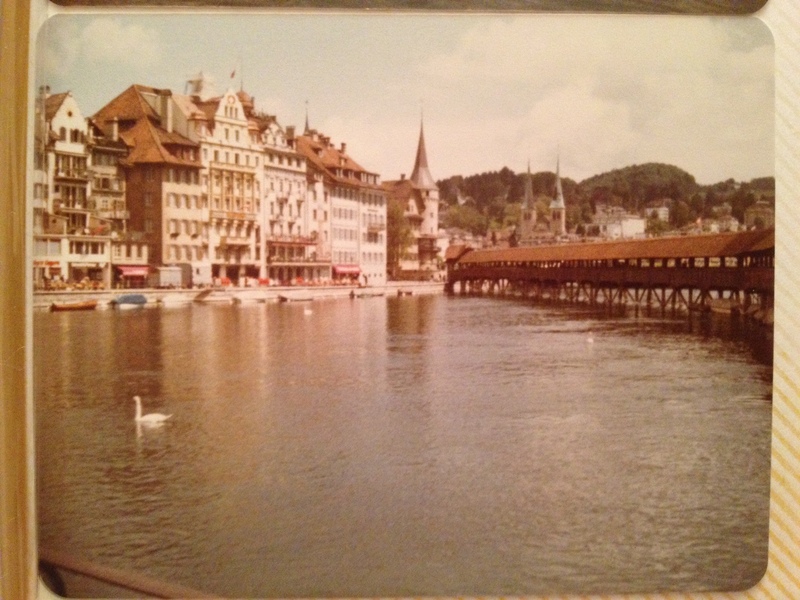 It really was long ago and far away when I celebrated my college graduation with friends at that Lucerne café. For nostalgic beings like me, I’ll take it as a memory to be treasured. 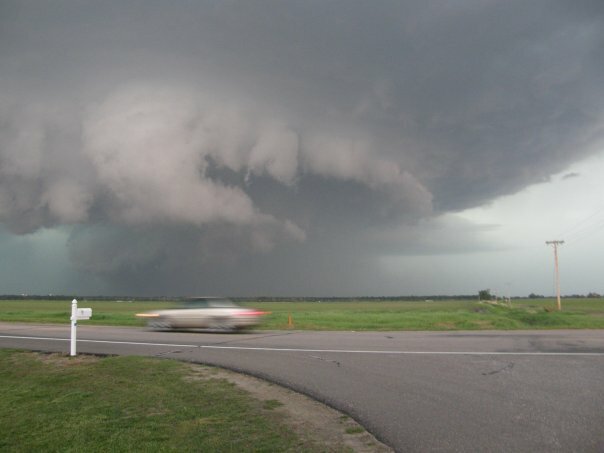 Six years ago this month, I was embarking on one of the great adventures of my life: A week-long storm chase tour, sponsored by Tempest Tours, a professional storm chase tour company. Okay, so maybe I exaggerate, but not by much. You see, ever since I was a kid growing up in NW Indiana, I had harbored a fascination with tornadoes. When I was very young, a tornado touched down in our town of Griffith, Indiana. Mom had my brother Jeff and me safely huddled in the basement. (I don’t know if we actually were huddled; it just sounds like the thing to do when a tornado is passing over one’s home.) Fortunately our home was not badly damaged, although I remember being bummed that our swing set was blown over! Ever since then, tornadoes had this draw upon me. Well into my adulthood, I would have dreams about tornadoes (and still do). When I read a newspaper travel section piece about a storm chase tour written by novelist Jenna Blum (a bestselling author and now among my dear friends), I tracked her down and asked her whether this was all legit. She was effusive in her praise of Tempest Tours, so I saved up my money got out my credit card and signed up for their “Memorial Day Week” tour in May. Our group of 20 or so converged on a “base motel” near the Oklahoma City airport, and we began our tour with an extended orientation on the art and practice of storm chasing, safety issues, and general logistics. Our guides were honest with us in saying that a storm chase tour cannot guarantee a tornado sighting; after all, Mother Nature is not in partnership with them. (Real storm chasing, you see, rarely involves hopping in a car or van and then quickly running into a bunch of tornadoes.) 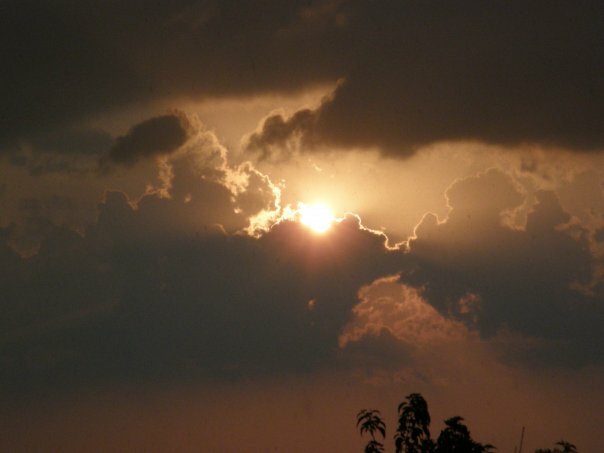 Nevertheless, they promised to do their best to show us some of the best stormy weather during our week together. For our first tour day, it appeared that our best bet would be to blast into Nebraska, where the forecasts indicated some promising mischief in the skies for the next day. We loaded up our stuff and hopped in the tour vans for the ride north. Within around 90 minutes of departing OKC, however, the radar picked up a small front in northern Oklahoma that had produced a supercell, a storm capable of spawning a tornado. And so began our first storm chase! We had no idea that we had hit a surprise jackpot. This supercell would spawn multiple tornadoes. Our first sighting is pictured right below. I was awestruck; my heart was pounding with excitement. We spent the rest of the afternoon and early evening following this storm and watching numerous tornadoes. It was a singularly memorable day. Even writing about it gets my adrenalin going. The typical chase day is not so dramatic, at least in the morning. 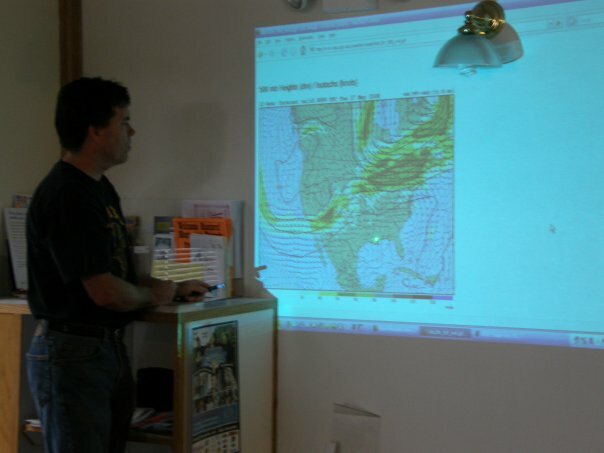 Breakfast is followed by a morning weather briefing. Here, Bill Reid, veteran chaser and our lead guide, previews the day’s chase. The late morning and early afternoon often involve a lot of driving to position the group for the most promising storm(s) of the day, paying close attention to evolving weather forecasts. Next comes more driving around the targeted area, followed by . . . waiting . . . waiting . . . more driving . . . and more waiting. You spend a lot of time gazing into the sky. It can be a very contemplative experience. When you sign up for a storm chase tour, you start rooting for bad weather during your vacation. 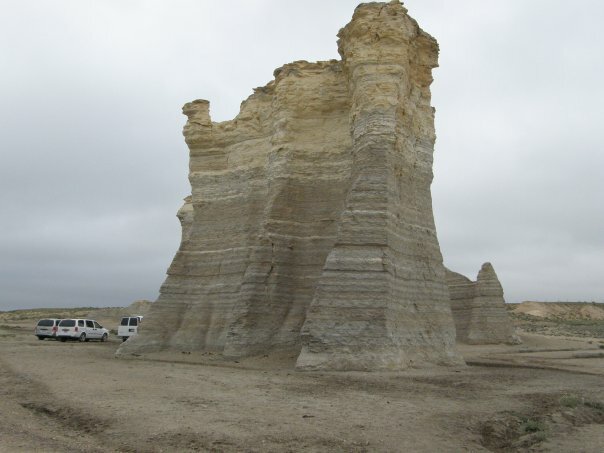 On days when the weather is nicer, or when your group is driving hundreds of miles to position themselves for a stormier brew the next day, you may stop at tourist-type places to see local sites, like the Monument Rocks in Kansas. Tornadoes are not always easy to see, especially if they’re wrapped in heavy precipitation. Here’s a rain-wrapped tornado going through Kearney, Nebraska. Though the photo doesn’t capture it, we could see sparks of electricity from power lines as the tornado made its way through the town. It’s not all about chasing tornadic storms. Looking into the sky while you’re in wide open spaces can be an awesome experience. Sometimes the views are simply spectacular. As corny as it sounds, it gives you a new appreciation for nature. Storm chasing is not for rank amateurs. It’s why I’ve paid good money to travel with, and learn from, some of the best and most safety-conscious storm chasers around. 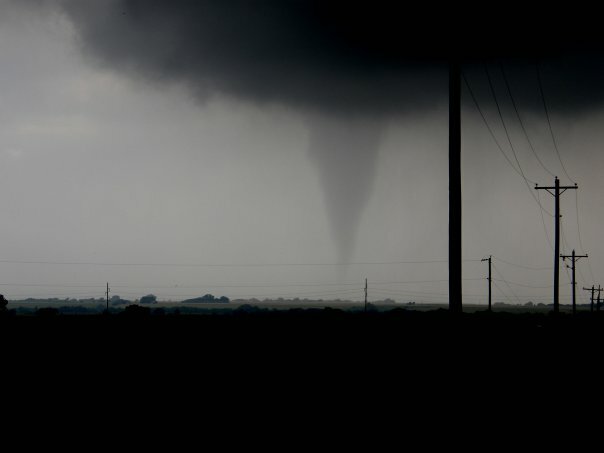 If we needed any reminder of the deadly power of these storms even for those trained in intercepting them, last May a massive tornado in El Reno, Oklahoma caused the deaths of three experienced, responsible tornado researchers, to the shock and grief of the storm chasing community. The risks posed by these storms must be honored. I’ve been on four subsequent storm chase tours since 2008. Each has been memorable. While I probably won’t be chasing this spring or summer, I’ll be checking the National Weather Service’s Storm Prediction Center regularly and turning on The Weather Channel when the skies get murky in Tornado Alley. You may be familiar with Jack Kerouac (1922-1969) as the author of novels (e.g., On the Road) and poetry that established him as an iconic figure of the Beat Generation. But did you also know that he was a big sports fan who blended a love of baseball and a rich imagination to create a homebrewed tabletop baseball game? 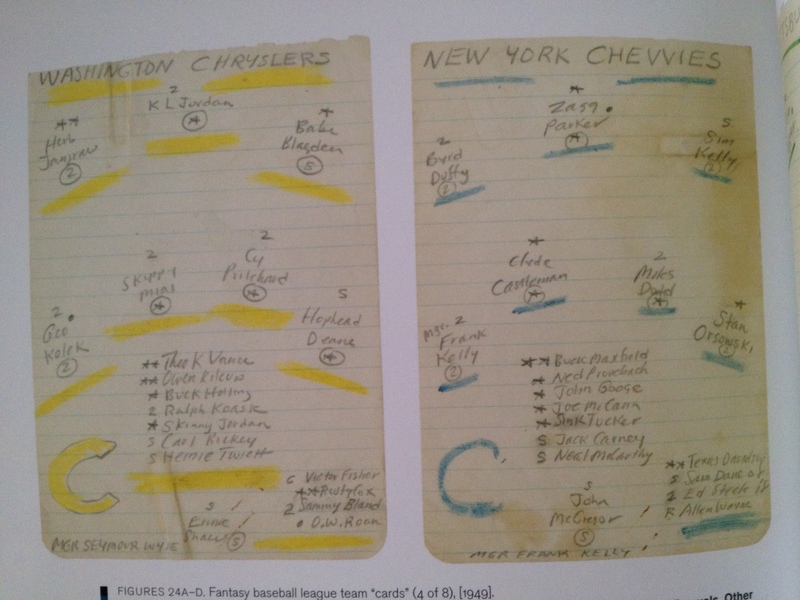 The game featured a league of fictitious teams and ballplayers that he played for years, well into his adulthood. 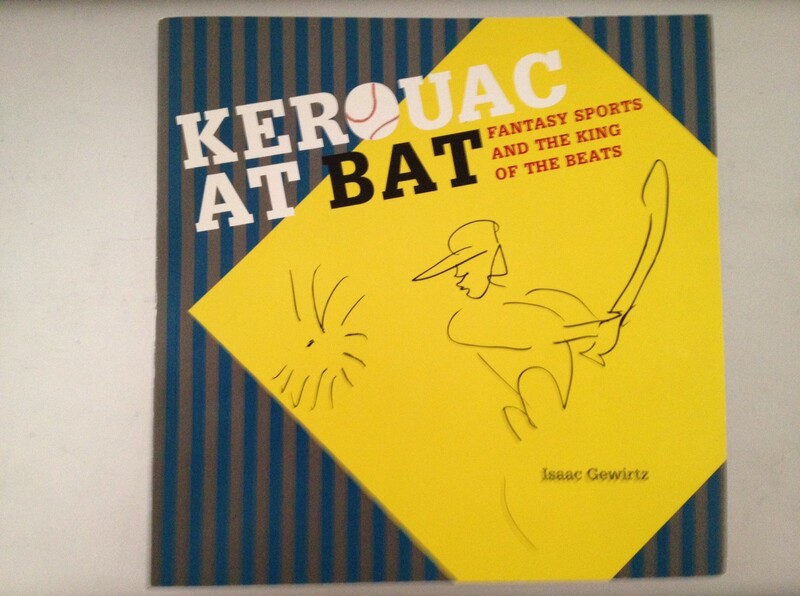 With baseball season moving into full swing, I’m delighted to highlight Isaac Gewirtz’s Kerouac at Bat: Fantasy Sports and the King of the Beats (2009), a colorful 100-page book about Kerouac’s fantasy sports world, including plenty of photos of Kerouac’s own baseball game and the voluminous league records he maintained. The book is published by the New York Public Library (Gewirtz is a curator there), and it’s listed in the NYPL’s online catalog. 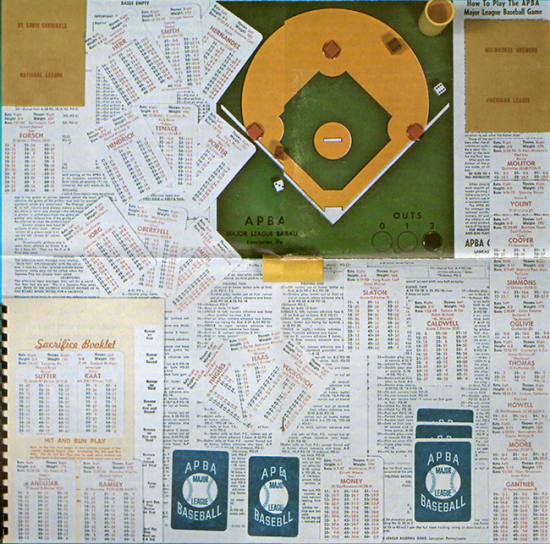 Perhaps newspaper reporter and APBA baseball fan Kenneth Heard is following in Kerouac’s footsteps with his terrific personal blog, Love, Life and APBA Baseball, in which he mixes game and league summaries with personal stories and observations about life. 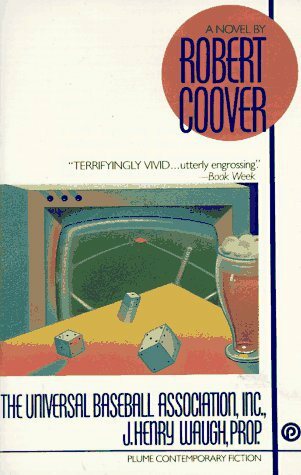 Kerouac’s fictitious tabletop baseball world also preceded Robert Coover’s The Universal Baseball Association, Inc., J. Henry Waugh, Prop. (1968), the tale of a man who invents his own cards & dice baseball game and becomes lost in the life of his fictitious baseball league. 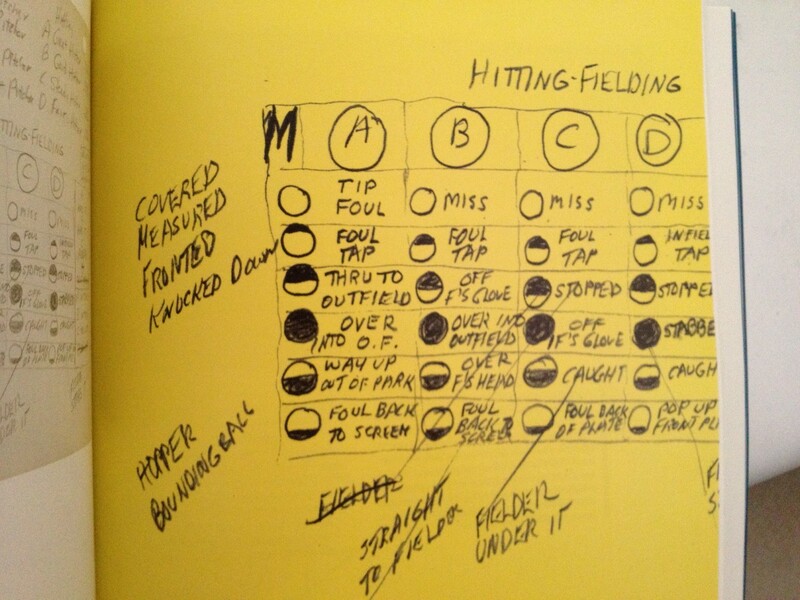 It’s considered a minor classic and one of the best books about the dramatic pull of baseball. But I digress! 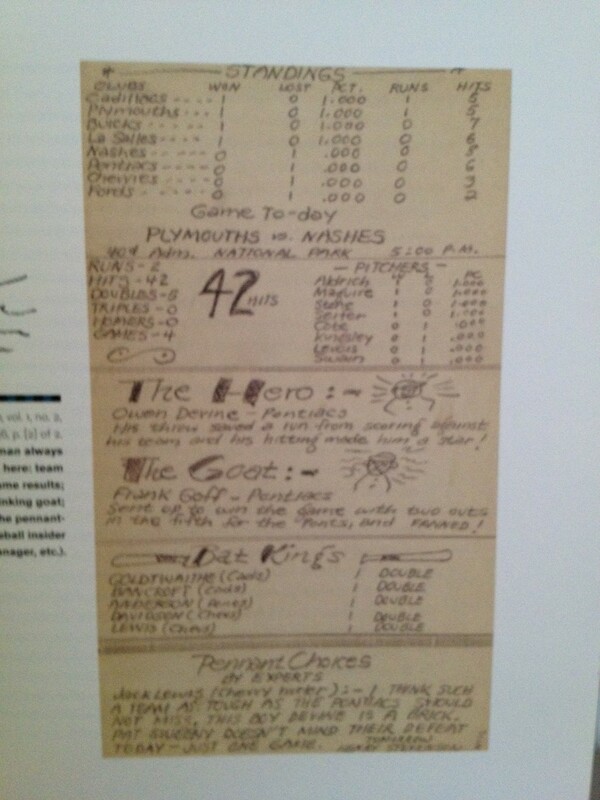 You see, it comes easily for those of us who, like Kerouac, enjoy recreating a favorite sport with the mind’s eye. Even if we lack his gift for writing novels, we can build a world of legendary sports accomplishments on our tabletops. 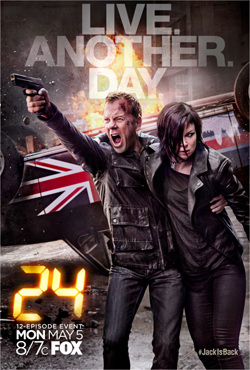 24 is an American television series produced for the Fox network and syndicated worldwide, starring Kiefer Sutherland as Counter Terrorist Unit (CTU) agent Jack Bauer. Each 24-episode season covers 24 hours in the life of Bauer, using the real time method of narration. Premiering on November 6, 2001, the show spanned 192 episodes over eight seasons, with the series finale broadcast on May 24, 2010. 24 gained something of a cult following, with its fans taking apart the many twists provided in each episode. Every hour served up a civil libertarian’s nightmare, as the, uh, goal-oriented Bauer stopped at nothing (er, almost nothing) to get the job done. With its fixed time frame and claustrophobic sense of contained reality, 24 created a compressed world of terrorist threats and violence. For many fans of suspense TV, including this left-of-center one, 24 was a guilty pleasure. Well folks, after a four-year hiatus, Jack Bauer has returned to the small screen in 24: Live Another Day, a 12-episode mini-series on Fox that premiered this past Monday. The two-hour opening episode is vintage 24, with plenty of Bauer-inflicted mayhem, some of it so over the top that I couldn’t decide whether to laugh, cheer, or grimace. Putting on my law professor hat, I saw countless violations of the law, not to mention grounds for a personal injury suit or three. In other words, I’ll definitely be following the rest of the season! Plus, I have an added incentive to watch. With the return of 24 comes the revival of a small, super-exclusive 24 e-mail discussion group made up of three of my college schoolmates and me. We’re all graduates of Valparaiso University, today dotted across the country: Sheralynn in California, Don and Myk in Illinois, and yours truly here in Massachusetts. For the better part of the show’s long run, we debriefed each episode and engaged in deep speculation on how the story lines might develop before the end of the “day.” Now we’re virtually reuniting again to pick up on this abbreviated season. With apologies to Don and Myk, Sheralynn is our best reviewer. She digs into the details and typically writes a sharp summary that competes favorably with the entertainment blogs. But we three guys aren’t slackers either. And so, through e-mails, we’ve created a sort of Web 1.0 equivalent of watching a favorite show in our dorm rooms and then kicking around the details later. All that’s missing is the pizza delivery.